Major airlines canceled thousands of flights and eased ticket-change rules ahead of the huge winter storm system sweeping from New Mexico to the Northeast. Airlines waived penalties for passengers who decide to postpone their trips. A wintry mix of sleet, frozen rain and snow coated much of the Midwest in ice, and snow was falling in the Northeast creating even more difficulties for airlines. 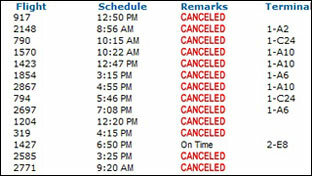 Yet most airports remained officially open as of Tuesday morning, and a handful of flights continued to operate. Dallas-Fort Worth Airport closed for about an hour Tuesday morning but was back up and running by 8 a.m., according to the Dallas Morning News. But many flights into Dallas have been canceled just as the city is gearing up for this weekend's Super Bowl festivities. O'Hare Airport remains open, but more than 600 flights were canceled by Tuesday morning, and more were expected to be scrubbed as the city awaits up to 20 inches of snow, according to the Chicago Tribune. Airlines have taken steps to avoid headline-grabbing events like the 1999 New Year's blizzard in Detroit that trapped passengers on Northwest Airlines' aircraft for up to nine hours or JetBlue's "Valentine's Day Massacre" of 2007, when an ice storm imprisoned passengers on parked aircraft. In addition, airlines may have become more cautious about trying to operate through tough weather conditions due to the Transportation Department's "three-hour rule," which imposes heavy per-passenger fines on airlines that experience tarmac delays of more than three hours. The airlines' capacity reductions also have made it more difficult to re-accommodate passengers who have been stranded in the middle of their trips.